Portfolio Work Response Exploration of the themes in the play "Legal Weapon" The diagram below is just a brainstorm of the themes uncover red in the play. Considering Andy's past. 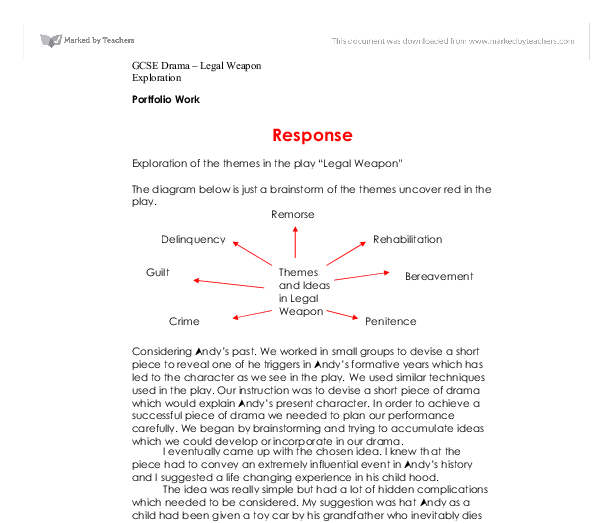 We worked in small groups to devise a short piece to reveal one of he triggers in Andy's formative years which has led to the character as we see in the play. We used similar techniques used in the play. Our instruction was to devise a short piece of drama which would explain Andy's present character. In order to achieve a successful piece of drama we needed to plan our performance carefully. We began by brainstorming and trying to accumulate ideas which we could develop or incorporate in our drama. I eventually came up with the chosen idea. I knew that the piece had to convey an extremely influential event in Andy's history and I suggested a life changing experience in his child hood. The idea was really simple but had a lot of hidden complications which needed to be considered. My suggestion was hat Andy as a child had been given a toy car by his grandfather who inevitably dies but as a result of Crime. My suggestion involved Andy being bullied as a child and having his toy car stolen by the bullies, as a result of the teasing he vowed never to be slow. The torment the bullies gave him scared him for life and the most memorable remarks for Andy were "You're too slow" or "You're not fast enough". When we finally began developing the piece it was important to emphasize these points in the drama because they explained a great deal about the whole story. ...read more. Development Use the style and technique of Legal Weapon to devise a presentation highlighting one of the themes covered in the workshop. After exploring Legal weapon to such a great depth we were ready to begin constructing our own presentation which some how incorporated some of the ideas present in Legal weapon. We started to think about the different possibilities of drama which we could explore. We sat down for a good 15 minutes trying to conjure up any appropriate ideas but we were not succeeding. We knew that our drama had to have some of resemblance or relationship to legal weapon and it was this restriction or criteria which made it harder. Eventually we came up with several ideas and this now became confusing and made it harder to make a decision about which one we would use. Then one of us suggested a really good idea of a loop in our play. This triggered all of our imaginations and we began to pour with suggestions. We finally came to an agreement about which ideas we would use. The idea of a dream becoming reality excited all of us and we began to develop an actual plot around it. We decided the main character would have a dream about and event which would actually happen in the future, a premonition, but he wouldn't be aware of its truth until it actually started to tae place. We knew that if it was to work it would have to be well organised and well thought through so we began breaking it apart and concentrating on smaller sections rather than the whole piece. ...read more. This scene involved a lot of movement and eventually flowed swiftly to the last scene as I previously explained in the response with Andy pushing the accelerator in his car and still shouting I am fast enough suggesting the idea that it was all a memory. I think that this was a very well planned response to the play and we achieved exactly what we wanted to. This however was only the penultimate stage to another performance. Our next drama was completely open to all possibilities the only criteria we were given was that it had to evolve around the theme of crime. I explained in detail in the development section what drama we done and how we responded to this task but I never explained our views and the audiences. After the performance we spoke to the audience (our fellow classmates) and discussed the good and bad elements of our performance. This was extremely helpful because it helped us understand how well we communicated our ideas. Our drama was extremely detailed and very well organised. We often tried to consider all the minor details in order to certify a professional performance. Little things like timing and positioning were rehearsed repeatedly until perfect. One part in particular was when I and Max had an overlap in our lines. This was intentional and it created a great effect when perfected. I feel that in both our performances we performed strongly and equally expressed our characters appropriately. I also feel that from the audiences' response and reaction we succeeded both times in generating entertaining and interesting pieces of drama. 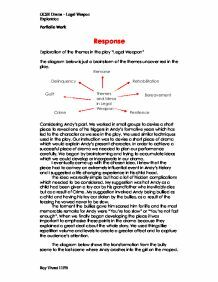 GCSE Drama - Legal Weapon Exploration Roy Vivasi 11PB ...read more. * Fox * MGM * Paramount * RKO * Warner Bros. Not only were they large production studios, but they held actors and directors under exclusive multi-year (often seven years) contracts, and owned large cinema chains, thereby also controlling distribution and exhibition of films. Judy obviously felt no remorse and for this I feel nothing but pity for such an uncaring and evil person. At the end of this session we had to explore Judy's character in a number of different ways, but most people in the class gave the same feedback and response; Judy deserved all that she got. This equality demonstrates the emotion of the mother and son through movement. Here the son tells his mum that his best friend was killed. A freeze frame is used and we go straight into a flashback and act out the friends death. Here we only used movement and no text. NOB - (Lifts his shirt up to show flabby belly) That's why they call us... BOB&NOB - (Pause) (look at each other and shake hands) "TESTOSTERONE" (Both Bob and Nob get up and mime feeling their muscles) BOB - We are on the lookout! This speech comes to a climax towards the end as his volume increases and he begins to stand up in triumph and pride for his company's wellbeing and gratitude to all of his employees' hard work input. He was somewhat arrogant before he sat down at his seat and did the monologue at the A.G.M.